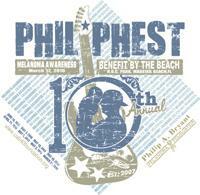 The Philip A. Bryant Melanoma Foundation will host its signature melanoma awareness event, Phil Phest, March 12th from 11AM – 6PM at the Madeira Beach Rec Center. Plan to stay all day for the live music, food & fun! This years line-up includes: Kevin Toon, John-Robert Rimel, That Pack, Pirate Flag (Kenny Chesney Tribute Band), Holey Miss Moley & the one & only Greg Billings Band headlining!